-- This fascinating book takes young readers on a trip to a science lab where they will learn about the metric system. Simple text shows ways of measuring length (meters and centimeters), temperature (Celsius), and weight (grams and kilograms). 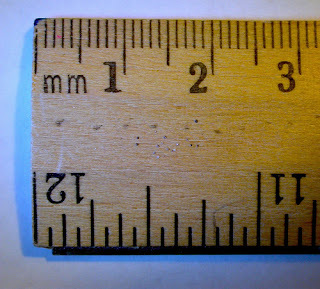 Comparisons between key metric measurements and similar U.S. customary measurements, such as yards, inches, and Fahrenheit, help children understand the two systems. • DIY Growth Chart Ruler Decal Kit -- You can easily make your own professional looking growth chart ruler - a great way to track and display the growth of little ones in your home or nursery! Join thousands of DIYers who have used this vinyl decal kit to successfully and easily make their own growth chart ruler by saving the time and headache of hand painting the lines and numbers on the board themselves! • Magnetic Metric Staircase -- Convert measurements. Includes magnetic staircase depicting the metric prefixes: kilo-, hecto-, deca-, deci-, centi-, and milli- and two magnetic markers. • Metric Measures Lotto Game -- This challenging, photographic lotto game helps children learn how to read a variety of scales relating to metric measures of length, mass, and capacity. Each board has 9 playing squares, showing clear images accompanied by a range of scales. Players read these scales and match the measures to cards on which the same measures are shown as numerals. - Think about your teddy bear sitting at home alone and bored all day. Wouldn't you like to give your bear a day to remember? -- Award-winning photographer Mark Nixon has created a trove of quirky and nostalgic portraits of teddy bears and other stuffed animals that have been lovingly abused after years of play. Much Loved collects 60 of these images along with their accompanying background tales. An exhibit in the photographer's studio led to a small sensation on the Internet when a few of the pictures circulated unofficially on scores of blogs and on many legitimate news sites. Viewers have been intrigued by the funny, bittersweet images and their ironic juxtaposition of childhood innocence and aged, loving wear and tear. When you see these teddy bears and bunnies with missing noses and undone stuffing, you can't help but think back to childhood and it's earliest companions who asked for nothing and gave a lot back. • GUND Philbin Teddy Bear -- one of GUND's most popular character bears in an 18" chocolate colored seated plush toy format. This classic design features cute paw pad accents and a curious expression that's impossible not to love! As always, high-quality and huggable soft plush ensures GUND products remain loyal pals for years to come. • Teddy Bear Cookie Cutter -- Our Tiny Bear cookies are great fit for adorable party favors and treats for Valentine's day, Baby showers and Birthdays. Create 3D printed cookies to match your 1st, 21st, 40th or even 50th birthday shower decorations or bring a homemade gift to the new happy parents. Children love little bear Paddington so they will love to lend a hand with baking gifts. • Teddy Bears Sewing Pattern -- The Bears are designed for medium weight fabrics. Suggest fake fur, chenille, Polarfleece®, velvet, felt, wool, boiled wool, boucle, denim, corduroy, terry cloth. Bears in two sizes are stuffed with polyester fiberfill. - Making an angel food cake is the best way to celebrate this day. A homemade cake beats a store bought one. Then, enjoy it with your family, friends, and at work. - The tuxedo dinner jacket made its debut at a ball in Tuxedo Park, N.Y.
- a day for global mental health education, awareness and advocacy. - Today's the day when we want ordinary, everyday people, to pour out their love for the drummers in their life. Or maybe even a complete stranger, who happens to be a drummer. Stuck up the back of a stage, working harder than anyone else in the band, the drummer is often heard but not seen. They need your love. - all about celebrating the potential in adjusting perspective with scale, viewed from the beautiful natural order of math and science. - to draw attention to homeless people's needs locally and provide opportunities for the community to get involved in responding to homelessness, while taking advantage of the stage an "international day" provides. - Have you ever tried your hand at cake decorating? Today is the day to take a class and whip up some buttercream frosting so you can decorate your own edible masterpiece. - a national movement to encourage shoppers to shift 10% of their spending to local businesses in communities across the United States. Shifting 10% of spending to local businesses over big-box stores makes an impact in communities across the United States.